The 20S EVO is the latest facelift to the 20S. The 20S EVO features the addition of a revised fixed type, shark fin antenna – as opposed to the 20S flip up antenna. 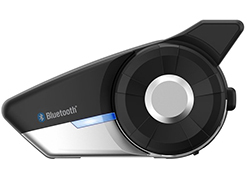 The 20S EVO features several industry first for the motorcycle Bluetooth communication headset market. 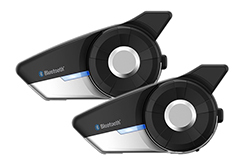 One industry first is the introduction of Bluetooth 4.1 technology with dual Bluetooth communication modules, to create one of the most advanced Bluetooth headsets in the market. 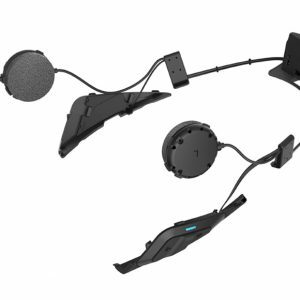 The new Bluetooth technology increases the performance and reliability of the headset while also allowing for increased high definition audio quality. The advanced Audio Multitasking allows for a seamless blend of incoming and outgoing audio to create a mixed audio experience versus the traditional interruption based audio technology of other Bluetooth devices. With the 20S EVO, users can call handsfree with their Bluetooth mobile phones, listen to stereo music or voice instructions of GPS navigation by Bluetooth wirelessly, and have intercom conversations in full duplex with a passenger or other riders. 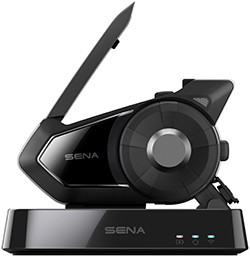 The Sena Smartphone App is available for users to download on both iPhone and Android smartphones to allow users to adjust the settings of their 20S EVO.